Rather than a sustained recovery, exports took a beating in October entering negative territory after a gap of six months with a fall of 5.04%. The RBI is expected to cut key policy rates by 25 basis points each in February and April 2015 to bring the repo rate down to 7.5% from 8% currently, says a Goldman Sachs report. Extending their record-breaking run, the Sensex today surged 131.22 points to end at a new peak of 28,177.88 and the Nifty rose 40.85 points to fresh closing high of 8,430.75 on the back of positive cues on the trade deficit front and robust gains logged by SBI and Tata Motors. The government will re-launch the popular investment scheme Kisan Vikas Patra tomorrow in a bid to boost savings and is gearing up for implementing more reform measures soon in the form of Goods and Services Tax (GST), Insurance Amendment Bill and changes in the Land Acquisition Act so that infrastructure projects are not delayed. Finance Minister Arun Jaitley will re-launch the Kisan Vikas Patra (KVP) tomorrow which will be available to the investors in the denomination of Rs 1,000, 5,000, 10,000 and 50,000, with no upper ceiling on investment. The investment made in the certificate will double in 100 months. The facility of transfer from one post office to another anywhere in India and of nomination will be available. According to the government, reintroduction of Kisan Vikas Patra (KVP) will provide safe and secure investment avenues to the small investors and will also help in augmenting the savings rate in the country. The scheme will also safeguard small investors from fraudulent schemes. Kisan Vikas Patra (KVP), a certificate savings scheme was launched by the government on April 1, 1988. The scheme was very popular among the investors and the percentage share of gross collections secured in KVP was in the range of 9% to 29% against the total collections received under all National Savings Schemes in the country. Gross collection under the scheme in the year 2010-11 was Rs 21,631 crore which was 9% of the total gross collection during the year. Indicating the rollout of more reform measures soon, Finance Minister Arun Jaitley said Goods and Service Tax (GST) and Insurance Amendment Bill are in the pipeline. He said he is expecting that Insurance Bill will be passed in the forthcoming winter session of Parliament. He said he was in touch with the Parliament Select Committee in this regard and will try to persuade it to give its report at the earliest. As regards GST, the Finance Minister said he was in touch with various state governments and most of the contentious issues had already been resolved. He said there were two areas, including liquor and petroleum products, where the states want to have taxation authority. Two states want entry tax and octroi to be kept out of the purview of the GST. 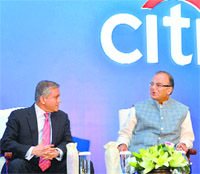 Delivering the key note address at the Citi’s Investor Summit, the Finance Minister said all these issues would be sorted out soon. He will also apprise the Empowered Committee of State Finance Ministers’ about the draft Constitution Amendment Bill on GST before introducing the same in Parliament. Jaitley said he was in discussion with the members of Opposition parties to make necessary procedural changes in Land Acquisition Act in order to avoid delay in the implementation of the infrastructure projects. To add to worries, gold imports jumped manifold to $4.17 billion, increased the trade deficit to $13.35 billion during the month as against $10.59 billion in October 2013. However, the trade gap is lower than the previous month when it was $14.24 billion. It was in March that exports growth was in negative zone last time, when shipments had declined by 3.15%. The RBI today said it is in discussions with the government to curb gold imports which have seen a sharp surge in the recent months putting pressure on the current account deficit. Gold imports surged almost four times to $4.17 billion in October from $1.09 billion same month a year ago. “With the surge in gold import which has been witnessed, it warranted a relook. Discussions are still going on between the RBI and the Government of India. 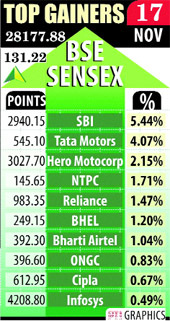 Once we know what the discussions are, further view will be taken,” RBI Deputy Governor SS Mundra said here. Expressing disappointment over the exports figure of October, M Rafeeque Ahmed, president, Federation of Indian Export Organisations (FIEO) said while exporters were conscious of challenges in emerging global scenario, at least modest growth of single digit was expected. He said surprisingly all performing sectors, which were expected to bring a turnaround either exhibited negative or miniscule growth. While engineering, drugs and pharmaceuticals, gems and jewellery, cotton and man-made yarn, carpets entered into the negative territory joining petroleum and plantation sectors, growth has moderated in leather, apparels and marine Sector. This is an alarming situation, said the FIEO chief, which needs to be analysed and addressed quickly before it is too late. Assocham president Rana Kapoor said a decline in exports in October is a clear signal about the nagging worries on account of slowdown in major world markets and the Indian exporters face a tough time going forward. With Japan going into recession, the ripple effects will be even more severe going forward. Urgent steps such as reduction in cost of production and fiscal support are required to ensure that our exports do not slip further into rough weather, added Kapoor. “We have changed our rate call to build in 50 bps of rate cuts by the RBI in 1H2015 from our earlier call of RBI on hold,” Goldman Sachs said. The global financial services major had earlier said the central bank would keep its policy rates on hold. The change in the global brokerage firm’s rate cut view is largely because of the recent sharper than expected fall in headline inflation, contained core prices, and no sharp increase in food prices despite a weak monsoon.